There are many components in windows and patio doors that can effect energy efficiency levels in your home. From Low-E glass to insulated glazing techniques, learn what innovative technologies are available based on your specific region and comfort needs. Dual and Triple Glazing - Many older windows were built with a single pane of glass. Energy efficient windows use dual or triple pane glass (or glazing) to better insulate and help reduce energy usage in the winter and protect against heat build-up during the summer. Triple glazing adds a third layer of glass that improves insulating properties, keeping homes in northern regions warmer. SunCoat® and SunCoatMAX® Low-E Glass Coatings - Low-E means ‘low emissivity’ and describes glass that has a solar control coating to improve thermal performance. Glass coating technology has helped create more energy efficient windows. A thin coating is applied to one side of the glass to reflect heat toward the outside in the summer and keep heat inside the building in the winter. As a result, homes with Low-E glass windows and doors enjoy more consistent temperatures year-round for comfort and energy savings. Carpet and furniture are also better protected against UV rays and color fading. Milgard SunCoat is Low-E2 and SunCoatMAX is Low-E3 giving you better levels of protection. 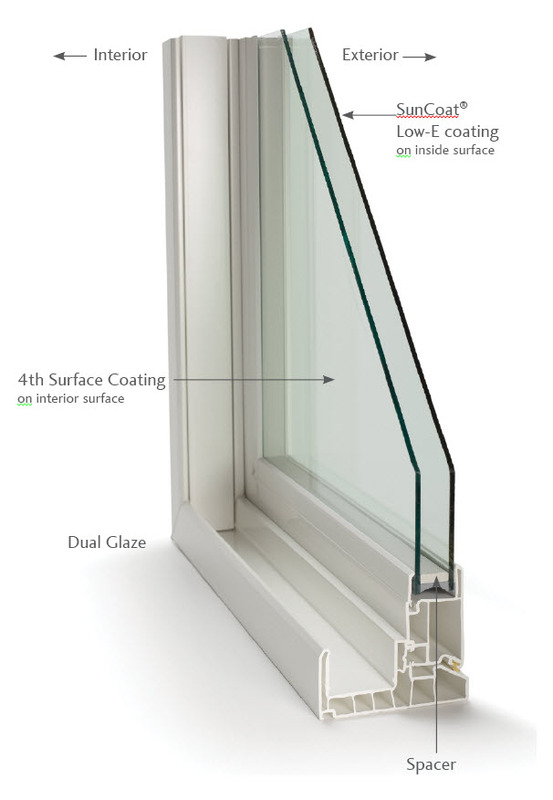 4th Surface - 4th Surface turns double-pane windows into triple-pane performers. It’s a durable TCO (Transparent Conductive Oxide) coating that enhances the U-factor of the window by reflecting heat back into the home. 4th Surface provides energy performance levels in a Dual Glazed insulated unit that previously were only attainable with our Triple Glazing option. It also offers more light transmittance and less reflectance than triple glazing. 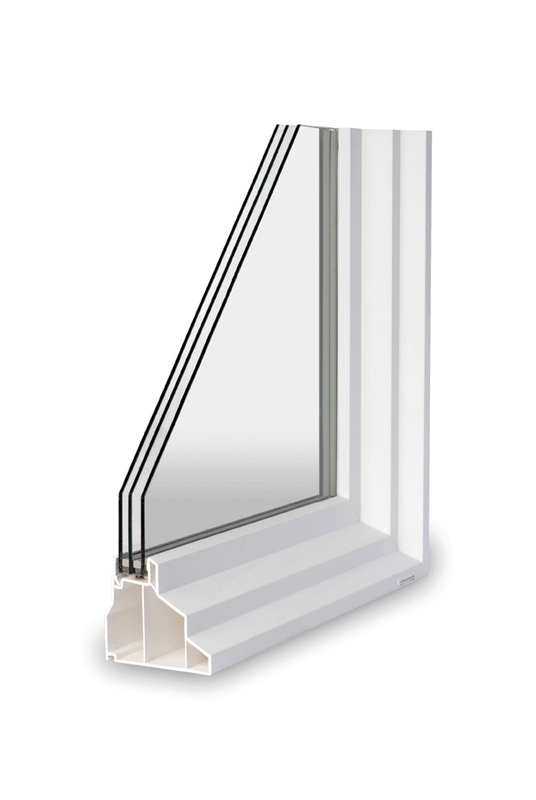 Spacers – A spacer keeps a window’s dual glass panes the correct distance apart for optimal insulation between panes. Too much or too little air space can affect the insulating glass efficiency. EdgeGard® and EdgeGardMAX® Spacers - Traditional aluminum box spacers use desiccant and sealant between two panes of glass to provide insulation. With a more advanced design, Milgard EdgeGard window spacers provide superior insulating properties and helps to reduce condensation. EdgeGardMAX is a state-of-the-art window spacer using an advanced design to stop heat flow and reduce condensation to improve energy efficiency and help extend the life of the glass unit. 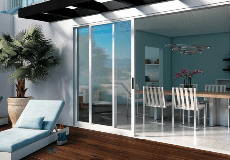 Argon and Krypton gas-filled air space- Argon gas, used between panes, is often an option offered by top window manufacturers. It enhances thermal performance without getting in the way of the view. Krypton is another invisible gas that offers higher levels of thermal protection. U-Factor - U-factor is a measure of heat lost and indicates how well a window, skylight or patio door can withstand heat transfer. The lower the u-factor value, the higher the insulating performance of a building element. U-factors on windows generally range from 0.25 to 1.25. Solar Heat Gain Coefficient (SHGC) - SHGC measures the amount of solar radiation transmitted through a window, expressed as a number between 0 and 1. The lower the SHGC, the less solar heat the window transmits. Your energy efficient windows could include one or more of the following features based on your climate.